Was it really only nine months ago that we first learned about Uxua, the magical small hotel built from restored fisherman's huts in the just as magical beach town of Trancoso, Bahia? How could anyone live without knowing such a place exists? 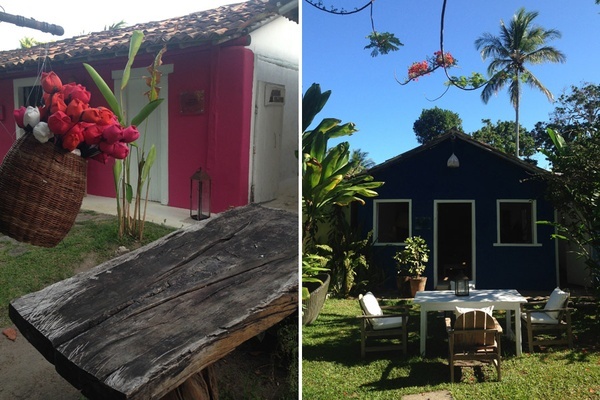 We asked our well-traveled Brazilian pal, Debora Roichman, to take us on a tour. 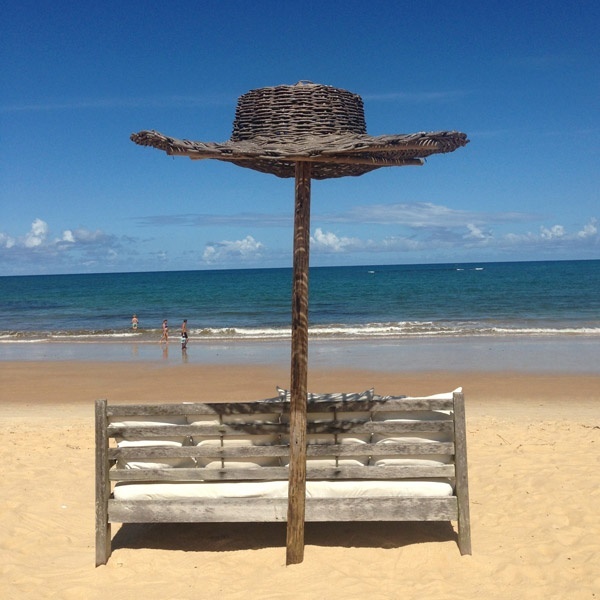 There really is no other place like Trancoso, a charming, quiet village surrounded by many beautiful beaches in the state of Bahia, in northeast Brazil. It's beautiful, calm, bohemian-chic, and very relaxed. A place that defines simple luxury in the Bahian spirit. The pedestrian-only Quadrado is the heart of Trancoso, the big square where everything happens. 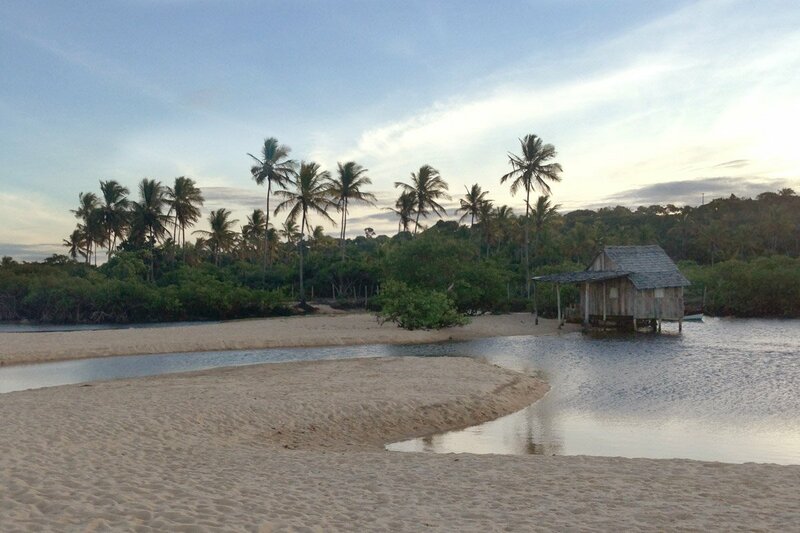 The Quadrado, punctuated by the whitewashed church of São João Batista and the pristine Bahian beaches, give Trancoso a mystical otherworldliness. This are was discovered some 30 years ago by creative emigrants who have since settled and restored — with great style and passion — the colorful homes that used to belong to fisherman, turning them into beautiful little pousadas (inns), shops, restaurants, and cafes, often naming them in honor of the original fishermen. This is a place for simple pleasures: food, beach, sunsets. Don't look for anything else. Life is about having a beer on the Quadrado at sunset and having dinner at a restaurant illuminated with lanterns. Go to Praia Espelho and have lunch at Silvinha's. 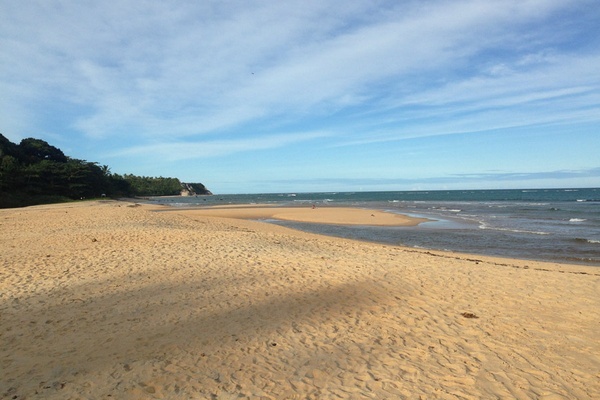 You'll have to hire a driver to take you to this remote beach about an hour from Trancoso. There are a few other small pousadas and places to eat, but Silvinha's is the highlight. For decades, Silvinha herself has been tending to the two small tables in the beautifully decorated, rustic, beachside shack, serving food that is simple but delicious. 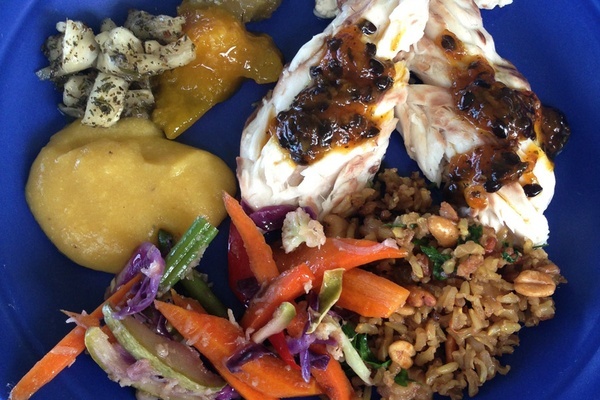 We had freshly caught fish, fried rice with small local shrimp and peanuts, and a variety of homemade chutneys. Silvinha's is an unforgettable find, even if by now it's well known in the area and has been covered by the New York Times and many travel blogs. You must call and reserve in advance. Catch the sunset behind the church overlooking the ocean in Quadrado. For lunch and drinks on the beach, go to Uxua Beach Bar and Estrela d'Agua (you must reserve ahead). When you come to Trancoso, you have to make a fundamental decision: to stay at the beach or on the Quadrado. From the Quadrado, it's a 15-minute walk to the beach — a trip that requires a taxi ride at night. But if you stay at the beach, you will spend less time wandering the Quadrado, especially at sunset when it is at its most magical. That said, there are exceptional hotels at the beach, and it might be a better option with kids. We stayed at Uxua, a stylish and rustically luxurious pousada on the Quadrado. The ten-casa hotel is owned and was designed by WIlbert Das, the former creative director of Diesel. Everything is based on local culture and materials, and it is beautifully done. I especially recommend the Irenio suite. It is living like a Bahian fisherman — if the fisherman had modern amenities, luxurious sheets, and incredibly good design sense. The other good pousadas on the Quadrado are El Gordo (7 Praça São João), which has an exceptional restaurant, and Capim Santo (55 Rua do Beco), the budget option, which also has a very good restaurant. The two best hotels on the beach are Estrela d'Agua, a Relais and Chateaux property with large luxurious rooms spread over manicured lawns and sand, and Etnia Clube de Mar, a smaller hotel that's very charming and cozy. Families should stay at the beach at Estrela d'Agua or Etnia. If you want activities for children, you could consider Club Med. (Yes, really.) There are many kids living in Trancoso, and they play on and around the Quadrado, so this is not a bad option. 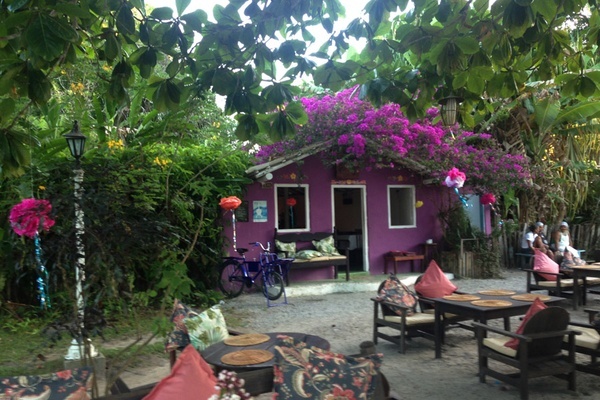 Trancoso has many excellent restaurants in the pousadas that line the Quadrado and at the top hotels on the beach. The best restaurants charge New York prices, even though you don't have to wear shoes to get in. The simple options from food stalls and little cafes are delicious and inexpensive. The most casual meal is acaraje from the food stall at the entrance to the Quadrado. Acaraje is a bean cake fried in dende (palm) oil and filled with peppers, onions, small shrimp, and hot pepper sauce. A Bahian tradition. Maritaca (Rua Carlos Alberto Parracho), on the road right before the Quadrado, makes very good pizza in a wood-burning oven for reasonable prices. El Gordo (126 Praca S. João) is known for its restaurant, which surrounds the hotel pool and serves gourmet versions of local specialties like grilled shrimp served over fried tapioca cubes. Cantinho Doce has good Bahian specialties with tables on the Quadrado. We had bolinho de aipim, a cake made with manioc flour and covered in shrimp. We were too full to order moqueca (fish and shellfish cooked in tomato, coconut milk, and dende oil), but it's supposed to be great. O Cacau on the Quadrado near the church has for years been considered Trancoso's best restaurant. They make excellent moqueca and Bahian specialties. Jacare is the Quadrado newcomer that's rivaling O Cacau for the title of best restaurant. It's already winning the category of most expensive. The menu is limited; the food is modern urban. We had a grilled pizza and a local version of carpaccio. It was good, but expensive for what it was. Our best dinner was at Uxua. We asked the hotel to prepare a camarão (shrimp) bobo and serve it on our table outside the Irenio suite on the Quadrado. Listening to live Brazilian music from the neighboring cafes and watching people walk the Quadrado while having a top-quality bobo with a good Argentinian wine was really special. Wherever you have dinner, make your way to the bar at Uxua that opens onto the Quadrado. It's a real treat. Like the rest of the pousada, you'll feel like youre in a Bahian fisherman's living room in the 1950s. They make their own sorbet, and it's as good as any you'd get in Italy. Order açai, the Amazon berry with healing properties, or mango. And wash it down with a fresh caipirinha. Adriana Degreas is one of the best bikini designers in Brazil. Stop into her shop and see why. Check out Divinos for artesinal home wares and jewelry. Osklen (5 Praça São João) is a popular Rio-based fashion brand with casual beach wear. 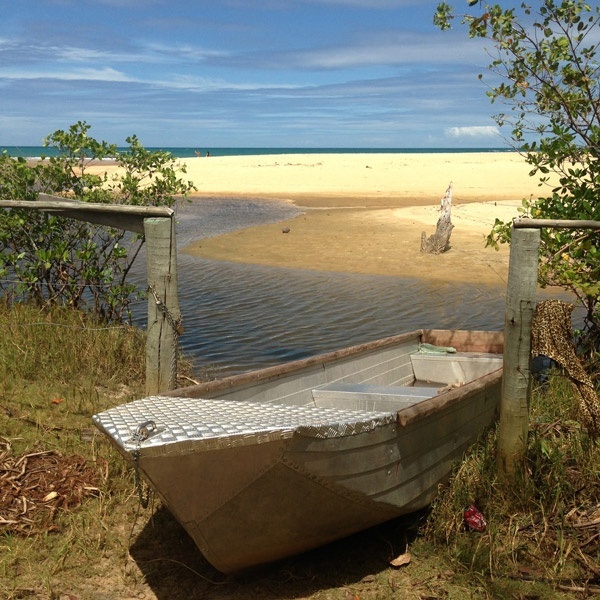 Fly to Porto Seguro Airport (BPS) from any major Brazilian city, then take a one-hour taxi to Trancoso. You don't need and wont want a car. There are plenty of taxis. The weather is great year-round. May and October are the rainy seasons, but other than that, it's generally 75º-80º and dry. Ten percent tips are automatically added to restaurant tabs. Small tips are appreciated for service at hotels. Capitaes da Areia by Jorge Amado, one of the most famous Brazilian writers from Bahia. This is his most best-known novel about Bahian culture. Débora is Belo Horizonte-based entrepreneur and world traveler. She travels to feed her hungry soul.